The history of the American experience tends to be viewed as exceptional relative to Europe. The tradition has generally been to view the course of American development as unique and separate from the antecedent European history that America originates from. One consequence of this ideological tradition has been to view corporate power as an anomaly to an otherwise well-functioning system, in which unfettered market forces generally produce highly competitive, small firms that do not possess effective market power. The actual history is quite different. From the very foundation of the American colonies big business has been the rule, not the exception. The Virginia Company, a joint-stock company that enjoyed an exclusive patent on very large swathes of land (see figure 1 below), established the first British colony at Jamestown in 1607. A patent is taken here to mean an exclusive grant by the sovereign with respect to a particular land tract, and establishes a fundamental claim to ownership and disposal of that land. The managerial class vested with the power of the charter administered all aspects of colonial life. Virtually all of the land that makes up the area that is described as the original thirteen colonies was held in ownership by a small set of individuals vested with property rights derived from monarchical legal traditions, granted with an exclusive patent for private development. The corporate firm and the legal structure of property rights coevolved in the course of US economic history. When we examine the going concern with an emphasis on its proprietary relationships with other aspects of the economy this codevelopment appears all the more transparent. That is, the firm is the site of a great many transactions in the economic system. Monetary transactions in which the firm makes a claim to resources generated in the economy involve rules governing the proprietary relationships between the transacting party and the resources in question. In order to secure exclusive and steady claim to a set of resources the firm must be contractually entitled to the resources as private property. Hence, it is important to study the codevelopment between firms and the legal framework on the matter of property. These transactions provide the foundation for the intangible value of the firm as property. Intangible value emerges as the firm is able to maintain differential advantage with respect to other participants in the market, as well as maintain control over stages in the production process in which the firm is engaged, while exerting its influence over matters of market governance. Precisely how society chooses to assign rights to such property is a matter of primary importance from the standpoint of determining the status of vestiture. Hence, insofar as firms embody the creation of property and affect existing claims to property, it is necessary to adjust the legal framework to establish a coherent system of property rights. By setting up the problem as essentially a relationship between the law and the corporation, we can appreciate the importance of the corporation in the development of American capitalism. Colonial America borrowed its legal framework from the English common law system. The common law tradition allows for judges to freely interpret new laws in light of old ones, suggesting that judges take an active role in shaping the subsequent development of legal institutions. This legal tradition of judicial instrumentalism will be important as we examine the changing nature of property and the firm. The fee simple system, as Americans would come to know it, embodies a set of rights. Property is often thought of as a “bundle of rights” for this reason. Accompanying these bundles of rights are a set of rents due the donor of the land, the king. Quit rents, then, represent the debt the holder of real property owes to the sovereign for the right to remain at liberty with the property. If the landholder defaults on this obligation by failing to make the quit rent payment, ownership reverts to the sovereign. Modern observers may look to a city like Kansas City, Missouri which possesses a large inventory of housing whose landlords are not current in their tax liability to the local government. Eventually, the state takes possession of the real property and all rights associated with ownership are revoked, until the property is disposed of again as private property. One of the principal legal developments in American economic history is that the state holds broad powers to establish and define markets, or otherwise exercise its police powers toward some economic end. This power allows the state to establish special privileges to private entities so that it may collect rents by controlling access to resources. For example, suppose a local municipality wished to transform a waterfall into a lock & canal system in order to facilitate inland navigation via steamship. The state may grant a franchise to a firm for exclusive use of the public right of way, thereby entitling the owner of the concern to a rent. Alternatively, the state may attempt to directly develop the falls to remove the impediment to navigation. In either case, the extent to which income is transferred from the community as a result of the establishment of a lock & canal depends entirely upon the discretion of those in control of the property, who must decide whether and to what extent they will charge rents. In general, the firm must earn revenues from its ongoing marketing activity in order to remain a going concern. One peculiarity of English common law was the institution of granting existing property holders protections against a future neighbor who may impose costs upon on them in their own pursuits regarding their property. The doctrine of ancient lights, as it was known, is the underlying concept of the practice of establishing a basis for prescriptive rights in common law. This common law principle suggests that the long tenured holders of property rights are protected from new developments that would diminish or impede upon their property, in an absolute sense. For example, a property holder who enjoys the benefit of, say, unimpeded sunlight would have the reasonable expectation that rival parties who wish to construct a home adjacent to their property would not be able to do so if it resulted in blocking such daylight. But, the doctrine of ancient lights was not restricted solely to the issue of sunlight, but more broadly as referring to general benefits to property ownership. In effect, the doctrine of ancient lights imputes a conservative bias in the course of development in such a way that favors temporal or generation advantage to prior property holders. As the American economy developed, this doctrine was tested in court and found to obstruct the economic development of urban areas. Prescriptive rights were found to be inconsistent with the social conditions in which American economic development was embedded. In 1838, a case in New York state, Parker v. Foote, established precedent for overturning the institution of prescriptive rights, wherein the judge ruled that the doctrine of ancient lights cannot be applied without inhibiting the growth of cities and internal improvements. Hence, the law was adjusted by judicial instrumentalism to accommodate and legitimate negative externalities as a byproduct of economic development. When economists refer to negative externalities they are describing costs that impact third parties as a result of some economic process not born by the agents principally engaged in such activity. Under English contract law, contracts were held as valid only when struck on an equitable basis. That contract validity rested upon notions of equity was vestigial to feudal institutions. Contracts were not considered valid if they were struck between two parties that were viewed as too unequal. For example, contracts between someone of sound mind and one that is mentally impaired would be considered invalid on the premise that the two parties were not equal in their contracting ability. It follows that based upon this equity consideration in the common-law tradition contracts between, say, a factory owner and an individual laborer would not be valid. In American capitalism, such an idea is anachronistic and incompatible with the manner in which value is extracted, appropriated and capitalized. While the equity tradition remained central to American contract law throughout the 18th century, four important changes to contract law would emerge in the course of American development. First, in the 19th century the courts interpreted contracts struck between free persons without compulsions as valid, on the principle that mutual assent generally implied validity irrespective of equity. For example, if a factory owner made the terms of employment known to the public and workers accepted a labor contract in exchange for wages, then the contract is valid whether or not the individual worker stands on equitable terms with her employer. In this circumstance equity refers to the balance of bargaining power between parties in transaction with each other. It would be absurd to think that a factory owner possesses the same bargaining power as an individual worker, for the owner controls and exercises their discretion over the the production process. Despite this lack of equity, the labor contract is considered valid so long as the worker knows in advance what she signing up for. Second, the rule embodied above, that of mutual assent or “meeting of the wills” as it is referred to in contract law, applied to transactions in markets. Provided the buyer is free to inspect the quality of the goods, then any asymmetry of knowledge regarding its quality or serviceability does not impair the validity of the contract in exchange. Third, contracts were struck in terms of market prices, as opposed to customary prices that ensure equity through time. That is to say, if the prices of the goods changed from the time the contract is struck and the buyer takes delivery, then the contracted price remains valid. This institutional change facilitated the development of futures contracts. A futures contract is nothing more than a promise to pay at a later date for delivery of some good, where the contracted price is settled in current market prices. The following breakout box provides a simply example to illustrate how they work. Suppose I am in the wheat milling business. I know that I need 100 bushels of wheat so that I can mill all of the meal I expect to sell next month. I have a feeling that next month the price of wheat is going to increase, so I decide to lock in today’s prices on the wheat that I’ll receive next month. I can do this by buying a futures contract from a wheat farmer for delivery of her wheat in a month, but at today’s price. Futures contracts are the foundation of a whole class of financial instruments called options, which are ubiquitous in modern American capitalism as they are used to provide risk hedging positions for firms that have an interest in the commodities that undergird the futures contract in question. They are also a means of speculating in financial markets, but that is a topic we shall avoid for now. The main point to remember here, is that changing from customary to market prices in contract law opened up space for the financialized firm to thrive and grow, essential to the development of the modern corporation. Fourth, the courts began to interpret contract law such that employer liability for hazards incurred by workers was limited. The presumption that, with the principle of mutual assent, dangers and risks associated with the workplace were encapsulated in the wage, implied that workers that agreed to the terms of employment absolved employers’ liability of injury. Additionally, the “fellow servant doctrine” suggested that employers were further limited in liability where injuries to an employee resulted from negligence on the part of his coworkers. Given the nature of production, it is common to expect that contributory negligence plays some part in the hazards, making it difficult for workers to establish negligence and liability on the part of their employer. Since John Marshall’s tenure as Chief Justice (1801- 1835), the Supreme Court has exercised considerable power in the shaping of American economic legal institutions. In the 1819 case McCullough v. Maryland, Chief Justice Marshall established the implied powers of the court in engaging in judicial review and revision of the legal framework as the court sees fit. The basic premise was that the constitution was intended to be robust through the ages to changes in the technical and social character of the nation. Accordingly, the court reserved the right and asserted its power to interpret its scope broadly; subsequent rulings would be made in light of new economic and social developments, while preserving the legitimacy of the constitution. In McCullough v. Maryland, the constitutional legitimacy of the Second Bank of the United States was under question. Marshall ruled that since the bank was chartered with the purpose of effecting the ends of the constitution itself, namely regulation of interstate commerce, then it was legitimate despite no specific provision in the constitution for a central bank. Several antebellum cases before the Supreme Court helped establish the power of the federal government to regulate interstate commerce via the Commerce Clause of the Constitution, superseding state and local desires for the same. In Gibbons v. Ogden (1824), the court overturned a monopoly granted by the state of New York to a steamship concern because its business involved traffic in New Jersey, ruling that individual states do not have the authority to regulate interstate commerce. While the powers of the port of Philadelphia were upheld in the service of regulating commerce for its municipal needs, Chief Justice Taney in Cooley v. Board of Wardens (1851) held that where such regulation touched upon issues of national importance, particularly involving its seaport, those regulatory powers were reserved for Congress. Brown v. Maryland (1827) ruled that no state had the power to license and tax importers. While the Supreme Court was laying the foundation for federal regulation of business enterprise, the immediate impact following Gibbons v. Ogden was the liberation of private corporations from state regulation. Not until 1887 with the establishment of the Interstate Commerce Commission, which emerged in response to problems associated with market governance in railroads, did the federal government assert itself on matters of regulation. As a consequence, corporations were free to grow and pursue national markets without the interference of local intervention. Recall, this discussion of the history of changing legal institutions is in regards to the proprietary nature of corporations. Perhaps the most important case governing the subsequent development of the legal foundations of corporate property and futurity in America economic is Dartmouth College v. Woodward (1819). Again, Justice Marshall plays a pivotal role in the coevolution of property law and corporations. The direct issue at stake was the legitimacy of Dartmouth’s corporate charter as it rested upon a grant from King George III, prior to the establishment of the United States. Indirectly, all patents granted by the King prior to the revolution were called into question if the court ruled the proprietary basis for Dartmouth’s charter to be invalid following the American Revolution. Marshall ruled that revolutions do not inherently undermine vested property rights. 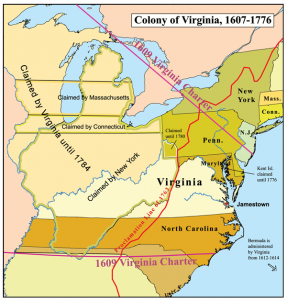 This granted legitimacy by judicial review to all original patents by the King, including the original Virginia Company patent, which accounted for a considerable portion of all land in the United State. Nearly all of the areas affected by the Northwest Ordinances were derived from the original crown patents, suggesting that overturning the Dartmouth charter could undermine the legitimacy of all American real property rights. The canalization of the America’s inland waterways, a period spanning 1815 – 1843, marks an important moment in the development of the corporation. Particularly, the canal building era laid the foundations for a newfound importance for corporations and the ability for private citizens to control the development of the social provisioning process. In short, society’s relationship with corporations changed as it used them as institutions for the development of large-scale public works projects. As the US grew westward, institutions were established to facilitate inter-regional trade, and bring to eastern markets the product of the hinterland. State governments issued franchises to concerns that incorporated on the premise that they would improve waterways in the interior watersheds of the nation. In return, the corporation was entitled to revenues associated with control over the canals. Similarly, firms were incorporated to engage in inland navigation along the canalized waterways and establish rates sufficient to cover their costs and in accordance with the principle of charging what the market may bear. That is to say, firms set prices and administer them to the market, allowing the firm to capture quasi-rents and accumulate monetary claims on its balance sheet. Firms are limited in the extent to which such rents may be appropriated from the public, which includes factors such as the ability to pay from participants in the market as well as rules, formal and informal, that may provide a governance structure to the market. For instance, an association may exist between navigation concerns that facilitate the orderly division of the market, which may impose limits on the pricing discretion of its members. In other situations, the market may be divided between firms with different cost structures. In the event that the firms with lowest cost structure establishes a market price, less efficient firms will be limited in their ability to capture quasi-rents from the public due to pressure to retain market share. The enterprises that were incorporated for the purposes of building and operating the canals were large. The engineering challenges before them required the organizational capacity to administer the provisioning of resources and labor that spanned whole regions. The firm was faced with planning challenges that exceeded the scope and capacity of small-scale proprietors. Consequently, most enterprises engaged in the canal business were cooperative ventures between private interests and the state. Private interests included merchants who wished to lower transport costs and grow the market for their trade, capitalists vested in navigation companies, as well as land speculators, who believed that improvements following canalization of waterways would increase the salable value of land held adjacent to the improvement. The state became the financial partner in the venture, providing institutional means for generating revenue through tax levies and bond issues, and remaining ultimately responsible for financing its ongoing maintenance. Notably, the Erie Canal, constructed between 1817 and 1825, was a landmark achievement of the cooperation between private interests and the State of New York toward the end of transforming economic relationships, such that corporations become a central site of social provisioning in the development of the American economy. Figure 2. 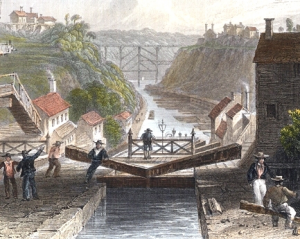 Workers operating a lock at Lockport, New York ca. 1839 along the Erie Canal. Engraving by W. H. Bartlett. Public Domain. To better understand how large scale public works projects, like the Erie Canal, were so transformative consider the financial and organizational implications of its development. First, the Erie Canal was financed largely through the issuance of bonds. Such bonds were held as wealth by private citizens who became vested in the interests of the canal as a going concern. To remain a going concern, the canal required the establishment of rates sufficient to cover its costs as well as sufficient traffic to provide revenues to support its financial liabilities. As a result, those financially vested in the canal as bondholders were compelled to take an interest in the development of the economic space as a whole such that the canal remained viable, to include promotion of settlement in regions adjacent to the canal and its feeder lines. The grandness of the venture required a further elaboration of the large-scale, economic interdependence in which national markets became increasingly important. Second, given the extent of private, monied interests vested in the canal, an administrative structure was required in order to ensure the orderly operation of the canal and its finances. In the case of the Erie Canal, such an administrative framework was established by legislature and structured as a commission, whose leadership were drawn from the business communities affected by the existence of the canal. access to the state legislature via the social networks of its owners and agents. In 1866 efforts to extend a regional trunk of the nascent transcontinental railway system into Portland from the Sacramento Valley in California involved courting the owners of the Oregon Steamship Navigation Company (OSN) on the presumption that their political connections would ensure special acts of incorporation from the Oregon legislature favorable to the Californian interests. Initially, such owners attempted to block the advance of the railroad promoters for threat of the viability of the going business of the OSN. However, later that year, perhaps hedging against the threat of eventual encroachment on their business, members of the OSN leadership sought to secure the franchise for the Oregon section of the regional trunk of the transcontinental, thereby securing associated land grants and privileges from the state, which set off a race between two competing concerns to build a railroad through the Willamette Valley in Oregon that would connect Portland with a road from California. The ultimate objective lied in establishing legitimate claim to the exclusive charter, ostensibly by demonstrating commitment to actually build the road and fulfill the spirit of the charter, while undermining the legitimacy of the rival concern through the courts and in the public mind through influence of the press. 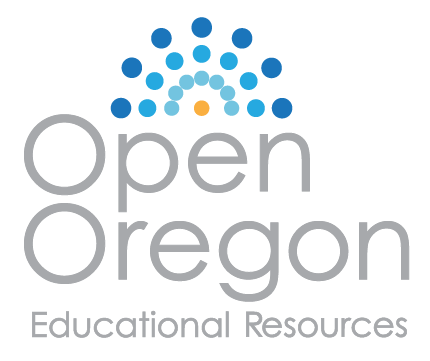 The outcome was mutual insolvency between the two parties, who had each incorporated variants on the name Oregon Central Railroad. In the late 1860s, the stagecoach magnate Ben Holladay resolved the conflict by purchasing control of one of the firms, persuading the legislature to reassign the charter to the concern he had acquired, and acquiring controlling stake in his rivals. Holladay reorganized his newly acquired railway assets under a new name, California & Oregon Railroad, together with some steamship ventures that he had established or acquired in order to provide a revenue source while he developed his railway aspirations. To finance this consolidation scheme Holladay floated a considerable amount of bonds to counterparties in Europe, who were falsely led to believe that the market in the Willamette Valley in Oregon was capable of supporting the revenue requirements of his steamship and railway concerns. The balance sheet of the Oregon and California Railroad relied upon lines of credit extended from speculative financiers to remain solvent. The Panic of 1873 undermined the solvency of the Oregon and California, as Holladay did not earn enough through revenues from his properties to service his debt obligations without the ability to issue new debt to refinance old. During a financial panic, creditors tend to stop lending, preferring instead to hold more liquid assets on their balance sheet for fear of becoming insolvent themselves, resulting in a vicious cycle of asset value deflation. The response by Holladay’s creditor’s was to install an agent to take receivership of Holladay’s properties and reorganize his properties on a sounder basis. The surest way to achieve this end was to buy out Holladay’s interests, thereby preventing him from exerting any control over the enterprises. Over the next decade, Henry Villard, agent for German bondholders would proceed to establish new market governance institutions in the Pacific Northwest such that economic activity adjacent to the railroads would be harmonized or rationalized, with the ultimate end of servicing the debt obligations to foreign creditors. Villard’s aspirations were grander than the German bondholders: Villard wanted to engage in thoroughgoing economic development and population growth. Villard wanted to build an empire on the Columbia River. A central problem facing Villard was maintaining control over the market for railroad traffic in the face of the encroaching Northern Pacific, the main northern line of the transcontinental system. The directors of the Northern Pacific wanted to run the line to Tacoma or Seattle, where the natural deepwater harbors would facilitate better access to international markets. Yet, Villard was vested in properties centered on Portland and its hinterlands. Villard organized a holding company in 1879, the Oregon Railway & Navigation Company, that consolidated his railroads and steamships in the Willamette with his acquisition of controlling stake in the OSN. Initially, Villard sought order in the market along the Columbia River via traffic sharing agreements with the directors of the Northern Pacific. However, the Northern Pacific was determined to build toward the Puget Sound. In order to protect the intangible value embodied in the corporations that he had come to control, he engineered a financial takeover of the Northern Pacific, through the use of another holding company, the Oregon and Transcontinental Company incorporated in 1881, which allowed Villard to pool funds to acquire control in the Northern Pacific. Once in control of the Northern Pacific, Villard connected the Northern Pacific with the Oregon Railway and Navigation Company, ensuring that any traffic destined for the Pacific would pass through Portland. It is important to note that holding companies are essentially financial corporations chartered for the purpose of acquiring majority ownership in another corporation, with a minimum outlay of cash. Holding companies can be layered, such that several holding companies stand between a given set of capitalists and the actual underlying corporations that the holding companies are designed to facilitate control. This can be illustrated with a simple example: suppose that a simple majority of stock ownership is sufficient to control a railroad corporation. If there are 200 shares of stock outstanding in the corporation, then it would be necessary to acquire 101 shares to ensure control. Now, suppose that a holding company can be incorporated and capitalized by issuing 101 shares of stocks and assuming parity value between the two stocks. 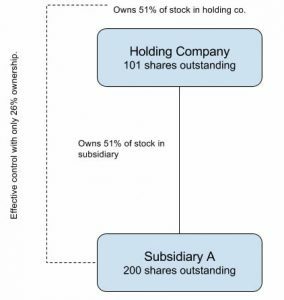 If the holding company is sufficiently capitalized and has access to credit, it is possible that by owning a simple majority in the holding company allows one to effectively control the first corporation if the holding company is able to acquire a simple majority of its stock, for half the ownership requirement (see Figure 5 below). With each layer of holding companies between the capitalist and the firm he wishes to control, the ownership stake required for control is halved. In this way, great corporations may be brought under control of a single individual with relatively little personal outlay involved. This has been a common theme in the area of corporate control since the second half of the 19th century, and continued well into the 20th century.